Varicose veins occur in almost every part of the body. Superficial veins become most prominent in the lower extremities because of venous insufficiency and the effect of gravity. Varicose veins of the hand are found on the dorsum of the hand (back of the hand) and cause significant concern to men and women. They are especially concerning to women above the age of 48, according to a recent study done at the Vein Treatment Center by Dr. Karamanoukian. The underlying cause for the prominence of the hand veins is aging and loss of volume (i.e. fat) in between the prominences of the metacarpal bones. So, as the hand becomes older, it has less fatty tissue in between and over the metacarpal bones. 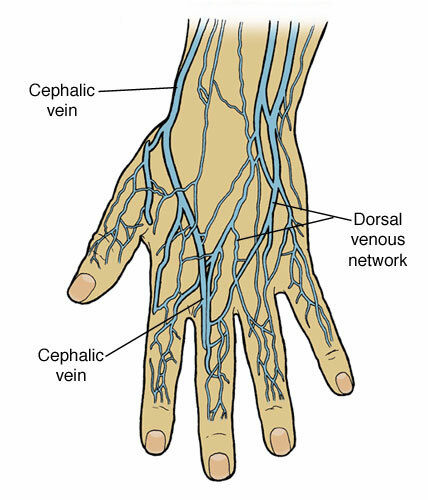 As such, the hand veins become more apparent under the skin and also as they ride over the metacarpal bones. Loss of skin elasticity from loss of elastin also worsens the problem by making the skin on the back of the hand thinner, more lax and saggy. It is often said by plastic surgeons that "the hand is a give-way for age", meanng that even after getting a lot of cosmetic surgery such as face lift, body contouring, liposuction, breast implantation, the part of the body which gives away the patient's real age are the hands. And so, most people who are cognzant of having hand veins seek tretment for it to hide their ages. Since the hands are extended when we meet others in social settings, it becomes a cosmetic priority for both men and women as they age. As a prominent vein specialist said, "the back of the hands are the biological clock of the human body" - Dr. Raffy Karamanoukian (my brother), as seen on The Doctors TV Show for his vein expertise. Rejuvenation of the hands can be accomplished by fat transfer techniques or with dermal fillers, which are like the fillers used to rejuvenate the face (Radiesse and Juvederm). Sclerotherapy and microphlebectomy are other options for the treatment of hand veins and we have expertise for both. Treatment for varicose veins of the hand are NOT covered by medical insurance. Please consult Dr. Karamanoukian for evaluation and for cost of treatment.